Towanda resident Mike Miller speaks about the effects of traumatic and acquired brain injury during a rally at the state Capitol on April 26. Miller, vice president of the Pennsylvania Brain Injury Coalition, led efforts to increase awareness of brain injuries and advocate for various measures in the Legislature to help with treatment, diagnosis and awareness. 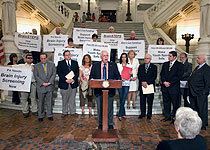 Towanda resident Mike Miller, vice president of the Pennsylvania Brain Injury Coalition, spearheaded efforts at the state Capitol this week to bring greater awareness of brain injuries and fight for legislation intended to prevent injuries and offer better medical treatment, said Rep. Tina Pickett (R-Bradford/Sullivan/Susquehanna). The coalition advocates the Safety in Sports Act, a continuation of previous years’ funding for home and community-based programs, an advisory board at the state level, and the incorporation of brain injury screenings for persons in state programs or facilities. In Pennsylvania, an estimated 156,000 concussions occur per year, Miller said at a press conference and rally held in the Main Rotunda. He also cited a recent study that found 15 percent of all high school football players reported concussion symptoms but only 47 percent of those players reported them to school or team officials. Brain injury kills brain cells and disrupts neural pathways. That can affect the way a person thinks, feels and acts. It also is the leading cause of disability and death from birth through age 40. Ten million Americans live every day with an acquired brain injury, and more than 130,000 Pennsylvanians are living with a long-term disability due to traumatic brain injury. The event also included remarks by several lawmakers as well as a teen victim of brain injury, the parents of children who suffered traumatic brain injury, and a representative of the Acquired Brain Injury Network of Pennsylvania Inc.